THAT well-known rule of never discussing politics and religion at the bar rang true for Bulli bullocky James Robinson in 1872. Robinson was new to the parochial little coal-mining village and caused quiet a stir with his political views. On his way home to Bulli Pass one autumn day he was invited to join a couple of blokes for a drink at the Railway Hotel. From the veranda, John Daly called to the bullocky as he passed the single storey timber inn to join him for a grog. Pulling up his team he decided to wet his whistle and joined Daly and James Madden for a refreshment. The three were the only drinkers in the bar-room. Apparently Robinson and the other two had differing views on the recent election of a local Member of Parliament and a fight soon prevailed. 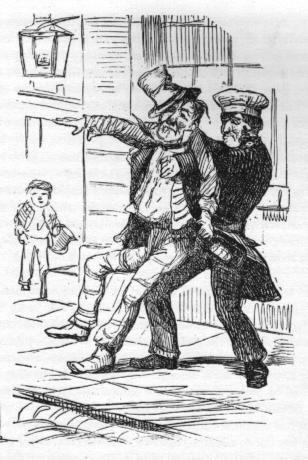 As a consequence Robinson summoned Madden and Daly to the Wollongong Court of Petty Sessions to answer charges of assault in March 1872. He told the court he tried to leave the bar after the fracas began but Daly dragged him by the collar back into the bar where Madden had ripped his coat and hat off and rolled up his sleeves. Robinson said the two began laying into him. Bruised and battered and still grasping his trusty bullock whip, Robinson lashed out, but came out the worse for wear. The fight was brought to a stop when hostess, Rose Ann Floyd called for her husband John to intervene. The court dismissed the case for lack of witnesses and the bullocky, no doubt, thought twice before again discussing politics at the bar. Light fingered William Anderson learnt the hard way after his heavy handed binge in the Black Diamond Hotel. Like many tipplers of his time, Anderson put in a heavy rum session in the bar of the Bulli coal miners' pub in October 1878. The drunken patron soon did his money leaving the bar and heading outside. Broke and full of Dutch courage he spied a cigar box through a window of the pub and decided to help himself to the pickings. Inside was a gold locket, two gold studs, jet brooch earings and six pocket hankies. The hankies would come in handy later! The publican's wife, Annasatia Wilson, yelled a warning as Anderson reached through the window and, with his prize firmly in hand, took off towards the Bulli Jetty. Next day Mrs Wilson confronted him, but Anderson had lost all memory of the incident: "I was drunk and didn't know what I was doing". She gave him the opportunity to return the goods without pressing charges but stupidly he walked away. Naturally he ended up in the Wollongong Court House, denying the charges, but unwisely stating that he would repay the two pound value of the goods. Sadly, he revealed, he had spent all his money at the bar of the Black Diamond. He was sentenced to 12 months hard labour in Darlinghurst Gaol. -Source Illawarra Mercury November 5 and 22 1878. Have you wondered about that old weather beaten bloke standing at the bar in those Carlton United Brewery posters? You know, the one proclaiming 'I allus has wan at eleven'? His name was Sam Griffin and this is how he became an early 20th century super model for that Victorian brewery which has made great inroads into the NSW market. 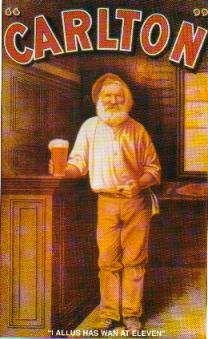 Carlton United brewery came across old Sam, who was a regular at McVeigh's pub in the Warbuton Ranges in Victoria, during the late 1890s. One morning publican Paddy McVeigh introduced Sam to the Carlton traveller who was doing his regular rounds. Offering the old bushman a beer, the sales rep jumped on a chance to use Sam in a marketing promotion after he replied "I allus has wan at eleven'. Not to miss an opportunity and eager to score some brownie points with his superiors, out came the traveller's camera and a few pictures were taken of Sam at the bar with his foaming beer. The pictures were in turn past on to the advertising gurus at the brewery, along with his proclamation that he always had a beer at eleven o'clock. Long before, 'I can feel a Tooheys coming on' or 'Well I think I've got it right now' and 'Give that man a New', 'I allus has wan at eleven' was a simple, but an effective slogan which caught the imagination of the drinking public. Sam was the spitting image of what a typical Australian bushman was supposed to have looked like,with his grey whiskers and prospectors clothing, and the promotion was a huge success for the brewery. His image was plastered on hoardings all over the State for which he was said to have received a small royalty. Sam enjoyed his new found fame and was always keen to relay the story of how he become a pin up boy for Carlton United Brewery to any one who cared to listen.